No matter what time of the day or night you need help, our trained crew is ready to lend a hand. Offering 24 hour towing assistance, the experts at Ben and Nino’s is always on call, ready to get you out a jam. When your vehicle breaks down, you need help and you need it fast. No matter what the trouble, our towing experts will have your car safely off the road in no time. A dead battery doesn’t have to leave you stranded. Call our Crown Heights team in Brooklyn to come get your battery recharged – and you back on the road. Getting locked out of your car isn’t just a hassle – it can be dangerous! Equipped with a variety of factory keys, the lockout crew at Ben & Nino’s Towing and Auto Repair can get you back in your vehicle within minutes. Run out of gas? No problem! Our towing services also include quick and easy fuel delivery. Is a broken down vehicle blocking your residential or commercial driveway? We will gladly come get it out of the way! 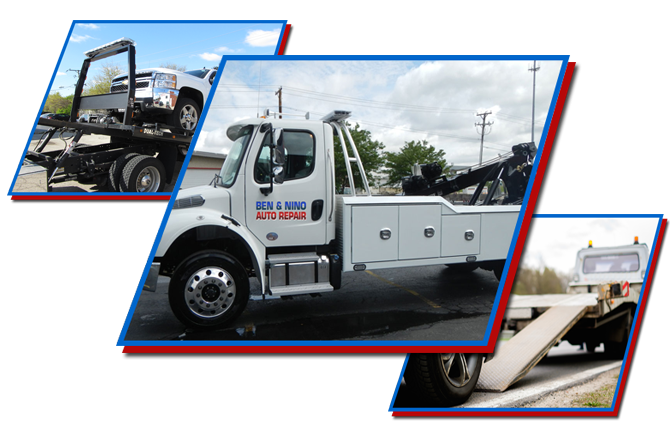 Whether you have a junker you want to get rid of, or someone has left an abandoned vehicle on your property, the towing specialists at Ben and Nino’s Towing and Auto Repair is ready to take care of the problem; towing the vehicle to the junk yard (or anywhere else you would like it taken). Don’t let car problems ruin your day. Call Ben and Nino’s Towing and Auto Repair to help you on the road again. Available to the Crown Heights community every day – all day — our crew of expert towing specialists can handle any job and get you and your vehicle somewhere safe.